I finally made Akit's blog! I can't believe you were on BART the same time as me and got my picture! Akit says: "If I drove a car irresponsibly and hit a person, I'd be blogging in prison." While I'm not touching this escalator debate with a ten-foot-escalator-approved-pole...I think we'll both agree there is plenty of historical precedence to show the above statement as hyperbole if not just incorrect. Try searching the phrase "driver was not cited" in SFGate and see what you get. That said: I enjoy the blog and you were most helpful with my switch from fastpass to Clipper. Elevators are frequently out of service at BART stations. If it's out on one platform and not the other you're supposed to take the train to the next station, turn around and come back to arrive at the opposite platform. This takes a lot of time. Stairs are dangerous too (have you ever tried carrying a bike down stairs with bike bags after shopping. yikes!). as a self-righteous urban cyclist i couldn't agree with you more. just as i'm bitchy and mean when it comes to others treating cyclists poorly i'm even more so when i see inconsiderate behaviour from my fellow cyclists. That's not a BART escalator. It's an MTA escalator. More often in the stroller camp than the bike one, but I suggest you try using just the elevators for a week where escalators are preferred. They're usually inconveniently located, often broken, often too small or just plain overloaded and slow. I think you'll find a lot to complain about. 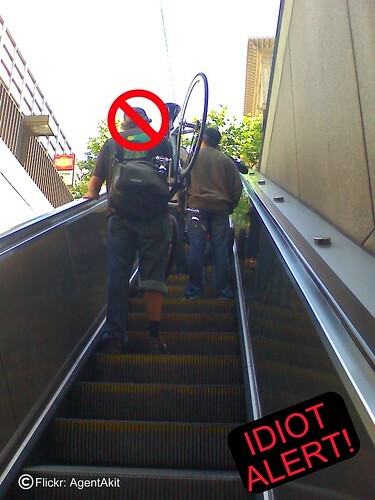 I agree that bikes don't belong on escalators, but niether do people who must pass everyone else on the short trip up or down. What's more dangerous to an elderly person with balance issues carrying a bag of groceries on an escalator, a person in front of them standing still holding a bike or a person trying to pass them on a moving staircase not really wide enough for two grown people? If you need the exercise, take the stairs. My fragile 78 year old Grandma Kim says: "Chill on the electric slide, kids". BTW I take my bike on Bart often and always use the stairs. Well, rules are rules. People break them, and the agents don't care. As many of you know the rule, "Bicyclists must use elevator or stairs, not escalators..."
According to CA Vehicle Code Sec. 21113, "A transit development board may adopt ordinances, rules, or regulations to restrict, or specify the conditions for, the use of bicycles..."
I've even seen cyclists on PM-commute SF-bound trains getting off at Civic Center, not Embarcadero, which they were supposed to get off. You have a bike anyway, isn't it too hard to get off early and bike to your destination? The destination signs have emphasized "NO BIKES," but they don't seem to care. So I agree with Akit, cyclists on public transit shouldn't be privileged. They need to think of others. Seems to me the start of airport service has really changed things on BART. I never take a bike on board, but I do go to SFO regularly (and OAK occasionally). If it is OK for people to bring two or three huge suitcases per person on any train, why are bikes banned during commute hours?